Girl's Guitar Method Complete, Everything a Girl Needs to Know About Playing Guitar! 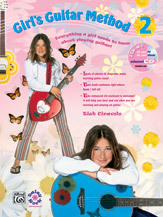 (Book & DVD (Sleeve)) (Guitar), #YL00-27650 : By Tish Ciravolo : Guitar Method or Supplement : Book & DVD (Sleeve) : Girl's Guitar Method : Everything a Girl Needs to Know About Playing Guitar! Combining the best-selling Girl's Guitar Method, Books 1 and 2 with the new Girl's Guitar Method DVD, the Girl's Guitar Method Complete Book & DVD package has everything a girl needs to learn to play guitar! 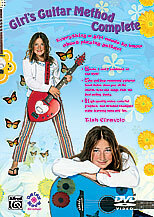 Written by Tish Ciravolo, the Girl's Guitar Method is the first guitar method written especially for girls. Thousands of girls all over the world are raving about this revolutionary method's fresh and energetic approach, with a style and design that addresses the interests of young women today. Teaching from a girl's perspective, this solid method promises a sure start down a lifelong path of musical enjoyment and all the heightened self-esteem that comes with learning to play an instrument. This package also includes the new Girl's Guitar Method DVD, hosted by internationally-renowned guitarist and Daisy Rock clinician Janet Robin. 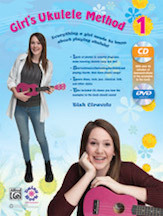 The Girl's Guitar Method DVD gives girls the chance to teach themselves how to play guitar by watching and learning from one of the finest guitarists in the world. This DVD will take you from the basics of guitar-playing, like tuning and proper posture, to advanced concepts like bending, hammer-ons, pull-offs, and slides. Based on a method made especially for girls, and hosted by a successful guitarist who's played with Lindsey Buckingham (Fleetwood Mac), Ann & Nancy Wilson (Heart), Meredith Brooks and Michelle Shocked, girls will feel inspired to learn how to play guitar and to keep playing!